FINE APPEARANCE. 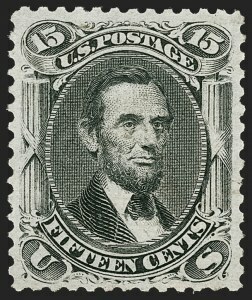 AN IMPRESSIVE LARGE MULTIPLE OF THE 1868 ONE-CENT E GRILL. FINE-EXTREMELY FINE. 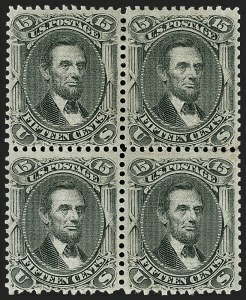 A STUNNING ORIGINAL-GUM BLOCK OF FOUR OF THE 1868 2-CENT E GRILL FROM THE TOP RIGHT CORNER OF THE SHEET. VERY FINE APPEARANCE. 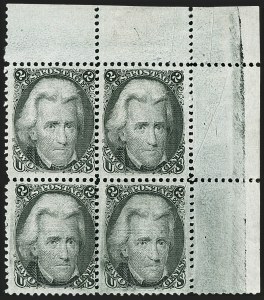 ONE OF TWO RECORDED USED BLOCKS OF THE 1868 2-CENT E GRILL. A GREAT RARITY. 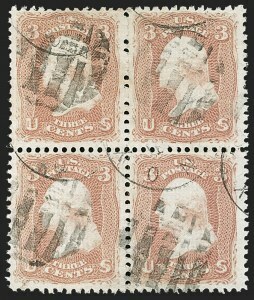 VERY FINE ORIGINAL-GUM BLOCK OF FOUR OF THE 1868 3-CENT E GRILL. 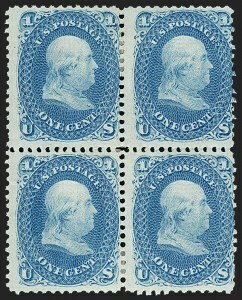 Very few well-centered blocks of the 3c E Grill have survived the mass extinction of multiples, as dealers broke them up in the 1980s and 90s to feed the market for choice singles. This is one of the last left intact. VERY FINE. 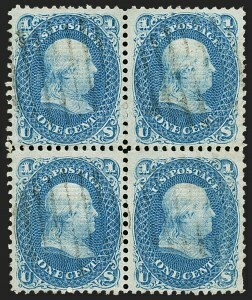 A BEAUTIFUL ORIGINAL-GUM BLOCK OF FOUR OF THE 1868 10-CENT E GRILL. 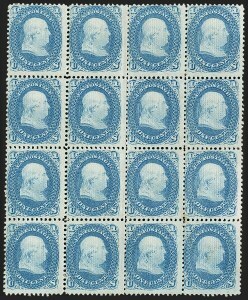 THIS IS THE FIRST UNUSED BLOCK WE HAVE OFFERED IN OUR AUCTIONS IN 20 YEARS. A PHENOMENAL RARITY. 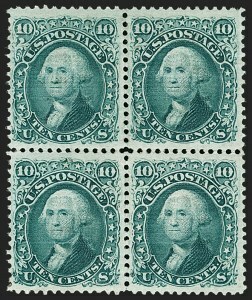 The 1956 Caspary sale contained a block of eighteen which was subsequently broken into smaller units, including singles. 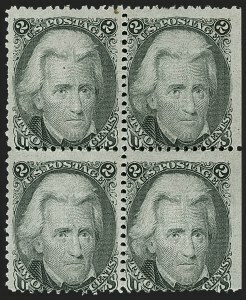 We last offered a block of four in 1998. 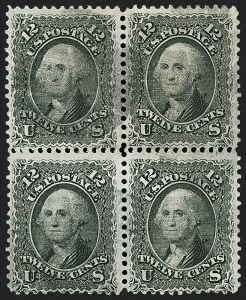 The block offered here, with the top two stamps in sound and centered condition, may not remain intact much longer. FINE APPEARANCE. 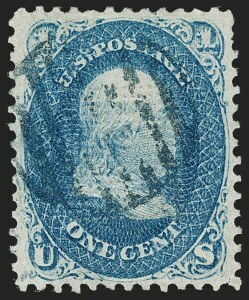 THIS IS THE LARGEST RECORDED USED MULTIPLE OF THE 1868 10-CENT E GRILL. We have offered very few blocks of any size over the years -- only two blocks of four in the past quarter century. Ex Curtis. VERY FINE APPEARANCE. 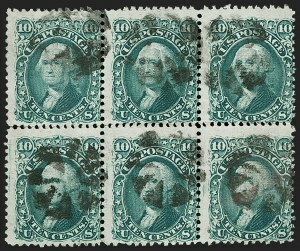 THE 15-CENT E GRILL IS ONE OF THE RAREST GRILLED ISSUE BLOCKS. 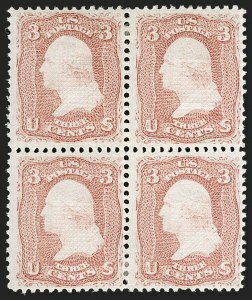 A BLOCK OF FOUR IS THE LARGEST RECORDED MULTIPLE FOR THIS ISSUE. 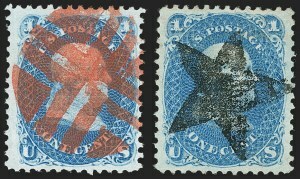 Our records contain only three or four other unused blocks of four, and no larger multiples. 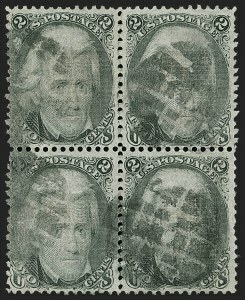 The Zoellner block of four was broken into singles after the sale, as have most multiples containing stamps with decent centering. Ex Lilly. 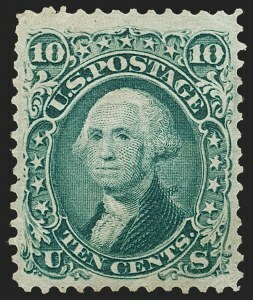 With 1968 P.F. certificate.